Pat-Aquanox solution is non-toxic and for pigments that does not induce artificial coloration. It safely promotes and maintains the natural colors of all types of fishes by inducing its natural color pigments to brighten up without the use of color hormones which will cause sterilization of the reproductive organs. Most color inducing chemicals will only give temporary coloration which will include other toxic side effects as well and will only promote matured and assists in the formation and maturation of the color. Application of Pat-Aquanox: Apply 1 capful (3ML) per 60 gallons of water once a week. Soak food with Pat-Color for 5 minutes before feeding at least once a week. Healthy Plants Require Balanced Growing Conditions. One way to have an unbalanced planted aquarium is to put a high level of lighting on an aquarium without adding carbon dioxide (CO2). CO2 is the main source of carbon for most plants, an essential element of all living things. Do Planted Tanks Require CO2? A high light levels and CO2 to stimulate fast plant growth. CO2 is relatively inexpensive. 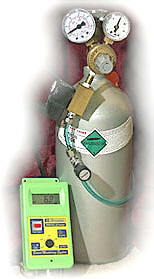 A CO2 canister holding 5 pounds of CO2 now lasts well over six months. Controlling CO2 consumption is not just a question of how much you put into the water but also how fast the CO2 is shed from the water. A 40 watt white florescent lamp for fast plant growth, high-lighting-level aquaria with more than 2 watts of light per gallon or lower the lighting level to 1.5 to 2 watts per gallon and enjoy a slower-growing planted aquarium. are to be avoided — silver dollars have an appetite for plants. Siamese algae eaters (Crossocheilus siamensis). 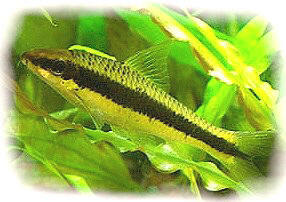 The fish will eat black beard algae & other plant material. Siamese algae eaters (Crossocheilus siamensis) will eat black beard algae and other plant material. Notice that the black stripe extends all the way into the tail fin. Adding a few Siamese algae-eaters (Crossocheilus siamensis) which eat very fine plant material, including black beard algae will see the algae growth disappeared within a few weeks coupled with dramatically plant growth--at this point you will have to start adding plant food as fish food will not be sufficient enough. 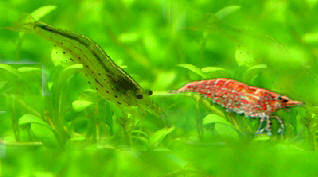 Siamese algae-eaters can be a great addition to help keep Black beard algae at bay. They will do some of the cleanup, and more importantly, will eat anything that grows as fast as it grows. You can find a lot of information on these fish if you search the Internet for the terms "Crossocheilus siamensis" or "Siamese algae eater" -- sometimes sold under the name of "flying fox". Appearance of "false flying fox" is similar to the Epalzeorhynchus kalopterus and has a similar bold black stripe running the length of its body but only the Crossocheilus' black stripe extends all the way into the tail fin. Algae growth occurs most often because of a lack of one or more macronutrients rather than an excess of nutrients. If any one of the three macronutrients is not in adequate supply, the plants will not be able to use the other two. 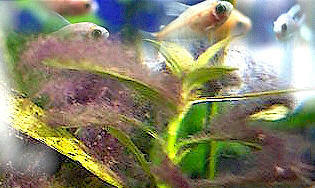 Put a phosphate absorber in your filter, and watch your plants slowly worsen and your nitrates climb. Using yeast fermentation bottle. You only need a couple of bottles to maintain good CO2 levels in a 92-gallon aquarium--great for growing fresh water aquarium plants and won't hurt your fishes. How to avoid having algae in your aquarium? Starve your plants and algae will grow. But can one feed the plants and avoid algae growth? by pruning away the infested leaves, removing affected hardware or driftwood, and scrubbing it clean. The algae will grow back, unless you can correct the conditions that allowed the tufts to grow and multiply. Black beard algae doesn't grow well in tanks that maintain high levels of CO2 (15/30 parts per million). You can add CO2 with a compressed gas cylinder fed by a commercially available "injector," air stone or reactor. Black beard algae also takes hold in tanks that have accumulated a lot of dissolved organic material. This is easily corrected through frequent large water changes, especially if you are dosing macronutrients (potassium, nitrogen, and phosphate). Ensuring that your tank has adequate macronutrients is also important for avoiding most kinds of algae that commonly grow in aquaria. Balanced growing conditions promote healthy plants and hinder algae establishment. One way to have an unbalanced planted aquarium is to to have a high level of lighting on an aquarium without adding carbon dioxide. When you see algae, you probably have unbalanced conditions in your tank. Too much nitrate will result in a lot of green algae on the aquarium glass; and if the amount grows excessively, you'll get green water. However, if the level of nitrate stays around 5 to 10 ppm, the plants will do well, and the algae will have a hard time getting a foothold. Similarly, phosphate levels around 0.5 to 1.0 ppm will not be a problem, but having less will be a problem. If there is too little, the plants will be hungry, and won't be able to use up the nitrates or potassium. A potassium level of roughly 20 ppm is good. These recommendations are for fast-growth, high-lighting-level aquaria with more than 2 watts of light per gallon or you can lower the lighting level to 1.5 to 2 watts per gallon, and enjoy a slower-growing planted aquarium. How can I control the algae? My pond water becomes murky and over loaded with algae. My 10 ft X 5 ft pond contains six Koi fishes about 2 ft in length uses pH of about 7.0 rain water. Do Planted Tanks Require CO2? Beautiful aquatic plants growth depends on lighting. With low to moderate lighting, adding CO2 is not necessary. Freshwater Java fern (Microsorum pteropus) can suffer from Java fern melt if blue-green algae is present due to nutrient deficiencies. CO2 is only a problem for fishes if you add too much to the water. A good level for plants is about 20 to 30 ppm. CO2 doesn't stress fishes until the level gets to be about 50 ppm. Water Hardness, black or red algae affect your aquarium. Some sword plants growing from a riverbed that was pure calcium carbonate--yet, the swords were flourishing. Favorite aquatic plants are the swords of the genus Echinodorus osiris, they can tolerate temperatures as low as 60 F or 75 F degrees. Pruning and Planting. fern, stem or rosette are not trimmed the same way, liverwort Riccia fluitans are trimmed by merely separating a portion of the mass by pulling or snipping. There is lot of algae build-up in my pond that lasts about six weeks. Would snails help to eliminate this problem? If so, can I use normal wild snails found in most outdoor lakes & ponds.